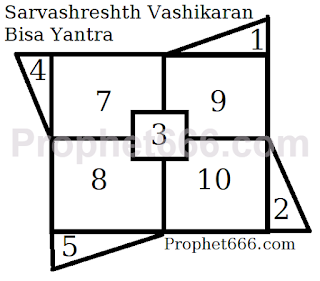 This is a Pure and Satvik Vashikaran Yantra Prayog, which has to be performed for 20 days in a row. The Bisa Vashikaran Prayog can be started on any auspicious day, Hindu festival or Shubh Muhurat. The Sadhak has to consume white colored pure food stuff like milk, rice and other non spicy white colored foods during these 20 days of the Bisa Vashikaran Yantra Prayog. He must observe total Brahmacharya and maintain a calm and composed mindset and refrain from getting angry and criticizing anyone. 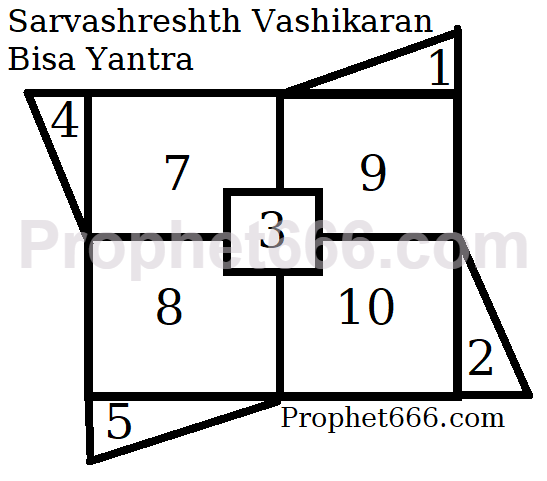 The Bisa Vashikaran Yantra shown by me in the image below should be drawn on a Bhojpatra using Anar Kalam and Ashtagandhta Paste. The Vashikaran Tantra says that drawing 20 such Bisa Vashikaran Yantras daily will make the personality of the Sadhak attractive, appealing charismatic and magnetic to every person and make that person come under a Vashikaran Spell. It also goes on to add that drawing 40 such Bisa Vashikaran Yantras daily will make the personality of the Sadhak so radiant and magnificent that even Gods and Goddess will appear in-front of him and help and advise him. After completing each days Sadhana, the Sadhak should offer Dhoop and Deep to all the 20 or 40 Bisa Vashikaran Yantras and then keep them is a clean place. After the completion of the 20 days of Vashikaran Yantra Prayog, the Sadhak should collectively worship all the 400 or 800 Bisa Vashikaran Yantras and offer Dhoop and Diya, then all the Bisa Vashikaran Yantras should be immersed in a body of flowing water. Note- The main thing about this most powerful and effective Bisa Vashikaran Yantra Experiment is that it should be performed with a total Satvik attitude. If the mind is diverted and the Sadhak starts thinking that” Sari Ladkiyan Ya Ladke Mere Upar Fida Honge” or “Main Sab Pe Hukam Chalaunga” then all the efforts will go to waste. The numbers of the Yantra can be written in Devanagari. That is up to you, it is not advisable to perform the Sadhana in the office, but at home or in such a place where there is no disturbance. It can be done in the office, if you are not going to be disturbed, there is no specific timings, but follow the same timing each day for all the days. Hope you are well. I have some queries. 1. Does it have to be 20 days continuous? Meaning is it fine to take 5 days break for periods n continue remaining days. you said to have white and Satvik Food. So, confusion is- there are many food which are Satvik but not white..
Ex- fruits grapes, almonds, Walnuts, sweet etc. So, pls clarify if those can be eaten? Also, salt is white. Can that be used while cooking rice? I do exercise and take protein powder with milk which is chocolate color. Guess, protein powder is not Tamasik. But want to confirm if that can be taken during this prayog? Yes, break should be taken during the periods. Satvik white food and other non-spicy food has been mentioned, non-spicy food includes the foods you have mentioned. Hi Sir, thanks for getting back soon. Post says pure white milk rice etc and 'non-spicy white' food. <1>The food I mentioned fruits,almonds,wheat,sabudaba,protein powder are Satvik but NOT white. So, is that okay to have? <2>And what about salt or Sindhu namak? I mean generally, during fast salt is not taken. But this is 20 days sadhna. So, please clarify if salt can be taken? <3> If I have to travel for work during those 20 days. Pls tell me once of this option. (B) can skip those days and continue from there? (C) It must be planned in way that no other break should be there except periods. Your guidance is valued. Thanks in advance. It is ok to take dry fruits and sabudana. A lille bit salt cannot be conscidered to be spicy. It is better to do this Prayog in your home or a place where there is no disturbance, break should not be taken. It should be planned when the periods are not likely. The Yantra does not have to be worn on the body and all the 400 or 800 Yantras ahve to be immersed as mentioned in the post.